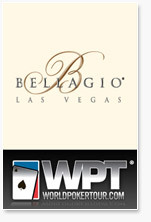 After the end of play on Day 2 of the World Poker Tour Championship at the Bellagio, the names at the top of the leaderboard read like a who's who of the live poker tournament pro world, and also of the online tournament pro world. For each name like Phil Hellmuth Jr., you have a name like Sorel "Imper1um" Mizzi, who is currently third in chips after the completion of Day 2. Dustin "Neverwin" Woolf, who is currently sitting with about 250,000 in chips heading into Day 3. Woolf has some big tournament experience, with a WSOP final table and a run deep into the 2005 Main Event under his belt. Justin "Zeejustin" Bonomo - got his year off to a smoking hot start placing high in numerous events. Bonomo is an incredible poker player, and could go deep if he can get a stack. Scott "BigRiskky" Clements - currently has 145,000 in chips. Chopped an event earlier at the World Poker Classic. Jared "Wacokidd" Hamby - We have written about Wacokidd's success at the World Poker Classic so far, taking down two tournaments and two bracelets. Wacokidd currently has 80,000 in chips, but is always dangerous. Other online poker pros such as Peter "Nordberg" Feldman and Noah "Exclusive" Boeken are still in the tournament, but are extremely short-stacked.